Explanation: Why would some regions on Titan reflect very little radar? The leading explanation is that these regions are lakes, possibly composed of liquid methane. The above image is a false-color synthetic radar map of a northern region of Titan taken during a flyby of the cloudy moon by the robotic Cassini spacecraft last July. On this map, which spans about 150 kilometers across, dark regions reflect relatively little of the broadcast radar signal. Images like this show Titan to be only the second body in the Solar System to possess liquids on the surface. 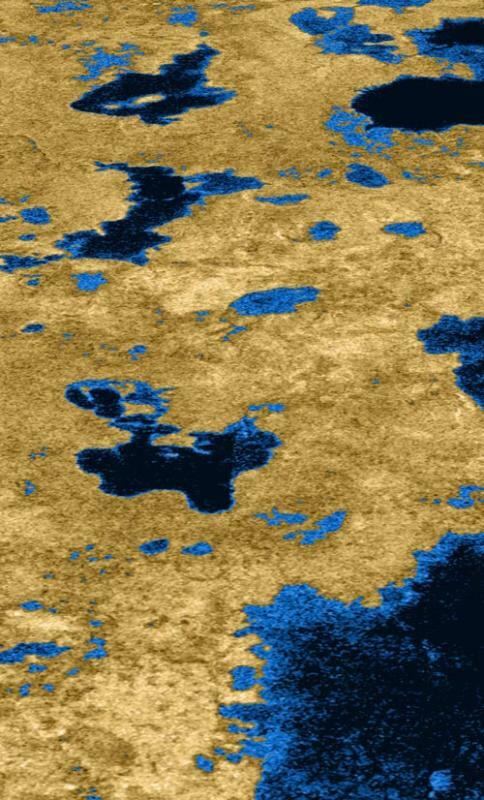 Future observations from Cassini during Titan flybys will further test the methane lake hypothesis, as comparative wind affects on the regions are studied.